DOUG CASEY is the author of Crisis Investing, one of the few financial books that made it on the New York Times Best-Seller list and spent 26 weeks there, ranking #1. Due to his contrarian views, Doug is a well-known and popular speaker at investment conferences. He is also the editor and publisher of the International Speculator, one of the world's oldest and most respected monthly newsletters dedicated to gold and silver stocks poised to produce profits of 100% or better in 12 months or less. Read on for his outlook on Gold's Corrections or click here to learn more about the International Speculator. Not surprisingly, gold's steep correction has generated some concern for resource stock investors. So let's take a look at the gold market. I figure the metal "should" be worth something like $1,000 an ounce now to be in a rough equilibrium with the value of other things the dollar can buy. That's an arbitrary guess; there's no exact method I know of to determine gold's real dollar value. If the U.S. dollar were sound, there would be a fixed amount of gold in the treasury for every dollar in circulation; in the 19th century, a $20 note was a receipt for an ounce of gold held on deposit, and a "dollar" was just a convenient name for a 20th of an ounce of gold. Today, of course, the relationship between the dollar and the amount of gold the U.S. Government has to redeem it with is so tenuous that it's completely academic. But, assuming that the government were just to make good on dollars held by foreigners - forget about Americans - how high a gold price might be needed? First we need to know how many dollars are outside the U.S. Nobody knows exactly. They constitute the reserves of most foreign central banks and the de-facto currency of record in dozens of countries for ordinary citizens. The amounts are almost beyond belief; it's said that, in Moscow alone, there are more US$100 bills circulating than in the entire U.S. Could $5 trillion be the number? If so, and if there are the reported 261 million ounces in the U.S. Treasury, the value of that gold comes to about $20,000 an ounce. Just to make good on the reported U.S. trade deficit of $800 billion for the last year, we're talking $3,000 gold. Forget about what the numbers would be if you added in the domestic money supply, M-3. Especially since they don't even publish it anymore. But the numbers, at this point, are academic. My basic view on gold is unchanged. And the fact it had a 37% gain this year, reaching a peak of $725 on May 12, or has given back 22% since then is meaningless in the big scheme of things. As I've said before, before this market is over, gold isn't just going through the roof; it's going to the moon. And the market is by no means over. It's just starting to wake up from a generation-long slumber. Why did it heat up the way it did? Perhaps the attention of the traders was drawn to gold by Bush's brinkmanship and buffoonery over Iran. Perhaps it was people noticing that gold was a relative laggard among the metals in this bull market. Perhaps the market was paying more attention to the Russians and the Chinese, among others, divesting dollars. There is solid evidence that dehedging by the producers helped fuel the surprisingly strong rally, and that that dehedging is now slowing. Likely it was a confluence of these and other factors. Thousands of hedge funds, most of which collect their 20% profits just to follow the trend, piled in. As the herd took their positions - especially when the short-term oriented traders had all bought - momentum slowed, and it went into reverse. Remember that most of these traders were toddlers the last time gold got anyone's attention, back in the 1970s, and so they only know what they've been taught - that gold is an anachronism, a valueless relic. Consequently, they have almost no understanding of gold's fundamentals. Consider, for instance, a primary reason given for gold's big correction is that higher interest rates will make gold a less attractive asset. As if there is some hard and fast rule that says gold can't move up when interest rates are rising. But that ignores the clear historical precedence of the 1970s when interest rates were surging at the same time as gold. It's unwise to try picking tops and bottoms in the market. But, the way I see it, gold has made its bottom as you read this. The fundamentals haven't changed; there's only been a swing in traders' sentiments. As for the gold stocks. We're still in the "Wall of Worry" stage of the market. The larger public is not involved, and the thin slice that is, is just moving with the price of the metal. The downdraft has been aggravated by the weakness in the NY market. Remember, gold stocks do best when both gold and stocks are rising and worst when both are falling. My guess is that now, after losing perhaps 25-30%, the big selling is over. The stocks will drift through summer, and the game will be on again come the fall. You should use this time to pick through the wreckage and put in stink bids on the issues likely to lead the market back. Although the best indicator is to watch popular magazines, with an eye to doing the opposite of what their covers scream, there's still too little public interest in gold to merit their attention. And it's too early in the market for your neighborhood cocktail party chatter to tell you much. Best to use your own psychology: when you feel bold and enthusiastic, sell. And when you're fearful and depressed - like now - buy, or at least line up your targets. Don't forget how much higher these stocks are now than a year ago. And remember they're likely to be much higher a year from now. The best recent analogue remains the Internet market. Every time those stocks sold off from about 1995 on, it just set the stage for an even stronger resurgence. That's how this market will play out as well. Finally, a reminder that volatility is the norm, not the exception, in gold and silver stocks. It's very important you only invest in them to the level of being completely comfortable with a 50% or even 90% loss. That's not just a passing platitude, but perhaps the best bit of advice I can give you. Reading some of the emails we've received these last few days, it's clear that some of you probably got carried away and so are now panicking. That is never the right frame of mind, under pretty much any circumstance, but especially when it comes to investing. As the gold and silver stocks come roaring back in a month or so, do yourself a favor and scrape enough off the table to get you back to the point where even steep losses are unconcerning. Meanwhile, patience, steady nerves and a focus on loading up on the best of the best at bargain prices will win the day. 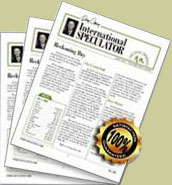 To learn more about becoming a subscriber to the International Speculator, click here.